SpongeBob SquarePants is a hilarious yellow square sponge who lives in Bikini Bottom. 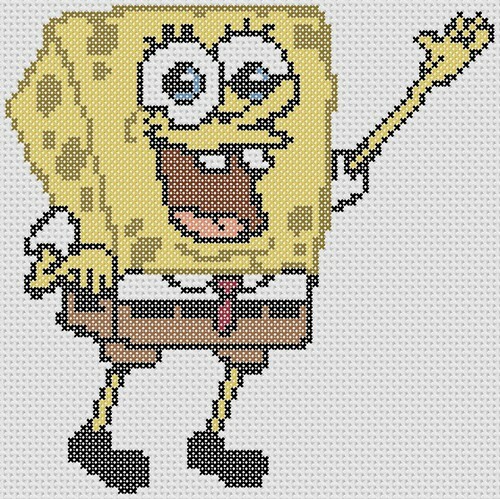 This SpongeBob cross stitch pattern would be great for your children’s embroidery project, or other cross stitch project for your loved one. You can also use this cross stitch patterns free download for your upholstery design, pillow cases, bed spreads, and so many more. We’ll be bringing more SpongeBob SquarePants characters as we go along. Download SpongeBob cross stitch pattern zipped file (approx. 430kb — downloaded 249 times). The password for this download is “crossstitch4free” without the quotation marks.